What is the best natural body wash? The choice is, of course, up to you. The answer can vary greatly depending on what type of skin you have and what you’re looking for in a body wash. We’re here to help you, though! We’ve compiled this list of body washes with the goal of showcasing as many different types as possible. We know you’ll find the body wash that is perfect for you. First, here’s some information. Package Size: How much are you getting? This can help you determine the value and tell you how often you’re going to need to repurchase the body wash. It’s good to know what to expect when you receive your order, too. Scents: What does it smell like? Some of the natural body washes on this list have no scent, while others are naturally scented from the use of essential oils and other ingredients. Keep an eye on this if you’re sensitive. 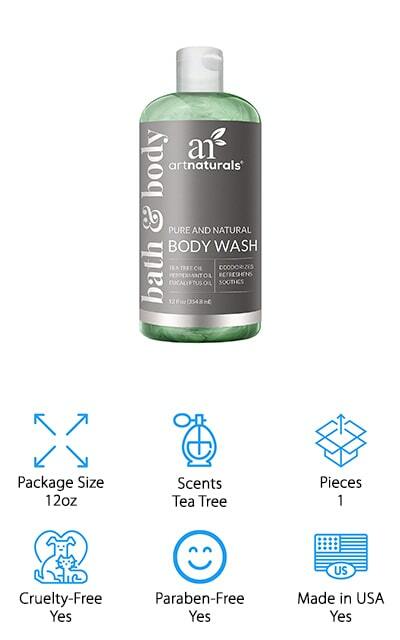 Pieces: Some of the orders come with more than one bottle of body wash. These bulk and value orders will last you a little longer than single purchases, which is great if you already know you love the body wash.
Cruelty-Free: Cruelty-Free products are not testing on animals. This is one of the most ethical ways to make products and many people prefer a cruelty-free product over one that doesn’t specify if it tests on animals. Paraben-Free: Parabens are preservative chemicals that are sometimes added to products to extend their shelf life. Studies have shown that they aren’t that great for you, so stay away from products with parabens if you can. Made in USA: Where the product is made is important to some people because they want to be patriotic and support their country first. We’ve included this information so you know where the product you’re buying comes from. With all that out of the way, we can start showing you the best natural body washes on the market right now. We’ve tried to include a variety of scents and soaps that are great for every skin type. We’ve done all of the research and review and tried to bring you a variety of the best body washes we could find. Our top pick and budget pick are our favorites, so check those out first! 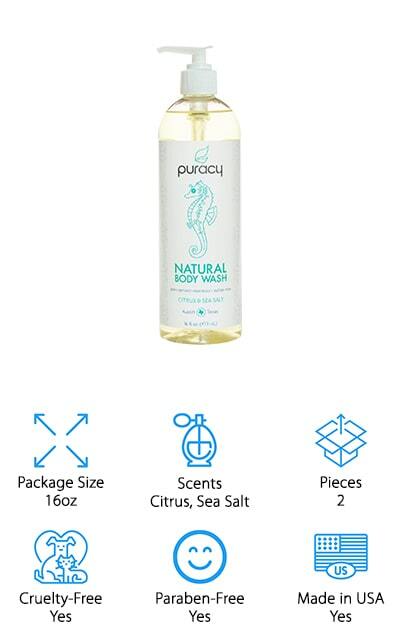 Puracy makes the best natural body wash that we could find. It’s our top pick for a reason! It’s a coconut-based cleanser made with natural, plant-derived ingredients. This particular scent is refreshing citrus and sea salt, like an orange grove on the coast! The sea salt helps to purify your skin, while the clinical-grade moisturizers keep your skin moisturized and beautiful. It contains no harsh chemicals that other body washes include like sulfates, parabens, and petroleum-based ingredients. There are no artificial perfumes or dyes to make it look or smell appealing. You’re getting completely natural ingredients in a great, moisturizing wash. This purchase comes with two separate bottles of body wash so you won’t run out any time soon! You can use this body wash daily, with all different skin types, and it’s been formulated for use with both genders. The whole family can get perfectly clean, soft skin with this great natural body wash! Our budget pick is the ArtNaturals Essential Body Wash. This soap is ideal for active people and can be used by people of all ages (as long as they are over the age of three). It has a natural antiseptic and anti-germ formula that also boasts anti-fungal properties. This body wash uses tea tree oil to help soothe and heal your skin from damage, dryness, and irritation. It also uses eucalyptus, oregano, and peppermint for the healing and deodorizing properties they provide. Coconut and jojoba oil work to soften your skin while eliminating the filmy residue that some body washes leave behind. All of the ArtNaturals soaps are completely natural and contain no parabens or other harsh ingredients. Plus, they are made without animal testing. Included in this package is one 12-ounce bottle of natural body wash made right here in the USA. It’s a great, affordable price for such a high-quality natural product. You’ll love it! New York Biology makes this great tea tree oil body wash. 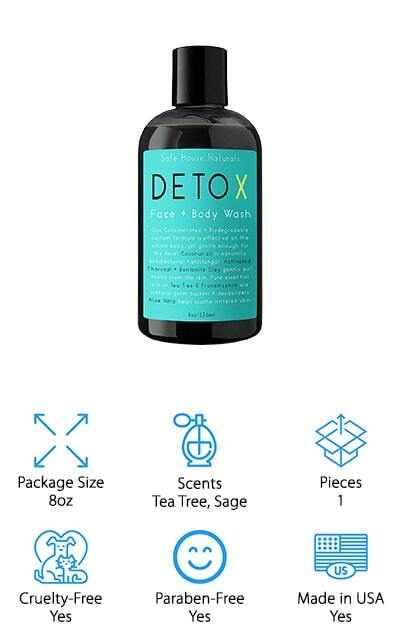 They boast that it uses up to 10 times the amount of tea tree oil that similar products do, so it works that much better at soothing skin and skin irritations such as Athlete’s Foot and Ringworm. Even if you don’t have any of those problems, this body wash has great anti-fungal properties. It contains the maximum allowed amount of concentrated tea tree oil, which we think is pretty amazing. Plus, it uses eucalyptus and peppermint oil to protect again itchiness and bacteria. Your skin will come out of the shower feeling moisturized and refreshed. The great thing is that it works well as an eczema body wash for soothing your dry, irritated skin. It is cruelty-free and is made with no synthetic ingredients or harsh chemicals! It’s all-natural and will help your skin feel so much better. Why not give it a try today? 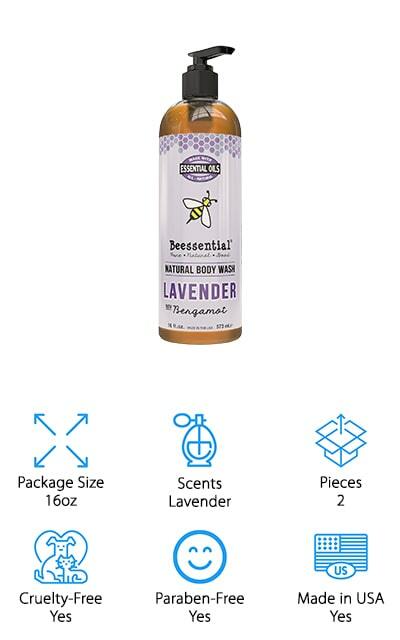 Beessential’s all-natural body wash is completely free of sulfates, parabens, and PEG chemicals. Instead, you get a soap that is made of completely plant-derived ingredients. The main active ingredients in this body wash are hemp, honey, and aloe, all of which help to soothe your skin and protect against irritations. It uses a hydrating coconut and olive oil blend that will lather beautifully and leave your skin feeling soft and clean. It’s one of the best all-natural body washes for sensitive skin because of all the fresh ingredients, including honey and beeswax that lend their name to the product. All of the products from Beessential are made in small batches on a family farm right here in the USA, so that’s a huge perk. Smaller batches mean that there is more quality control than with mass-produced soaps and products. You’re guaranteed a quality product from a source that cares about what they make. That’s great! This set of three soap bottles from SoapBox Soaps smell like coconut milk and sandalwood, a delicious natural scent that is both earthy and a little bit sweet. Both of these natural ingredients help to balance and hydrate your skin, leaving you feeling clean and refreshed while any skin irritation is soothed. This bath soap is enriched with aloe and shea butter for a deeper moisture that will lather up beautifully. It also won’t leave behind a residue, so your skin will feel great after your shower. Coconut oil helps your skin retain all of the natural hydration that you want it to have and protects it against damage caused by dryness. You can use it for every skin type and for both men and women. The best part is that each purchase of this 3-pack donates 3 bars of soap to someone in need. You can’t beat that, and you’ll have a ton of great soap! PETA approves of this all-natural body wash by Safe House Naturals – it’s cruelty-free and vegan, too! This formula uses a blend of bentonite clay and activated charcoal to purify your skin and gently lift toxins and impurities out of your pores. If you have oily skin, this type of exfoliation is a great way to help keep acne away and let your skin breathe. It also includes organic aloe vera to help tone and soothe your skin, while coconut oil and other essential oils work as anti-bacterial agents. Your skin is going to feel fresh and new after the use of this body wash, and you’ll get the added benefit of knowing that it’s great for the environment and was made without animal testing. This particular body wash smells like tea tree and sage, which are of course the essential oils that went into making it. We just know that you’re going to love this skin-clarifying face and body cleanser. This 9-ounce body wash by Majestic Pure is a great all-over skin cleanser. 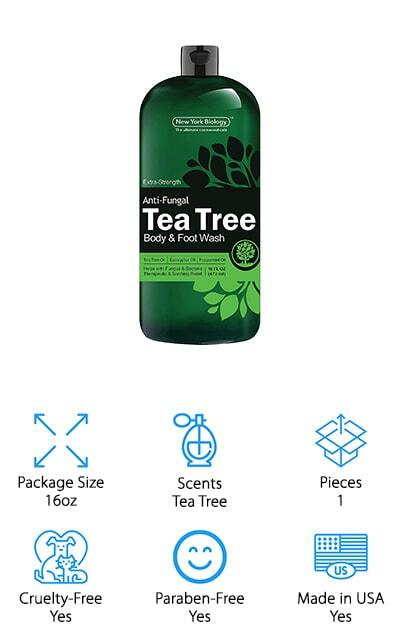 It is formulated with 10% pure tea tree oil for a soothing and great-smelling showering experience. It’s free of parabens and sulfates and is made right here in the USA, so you can support at-home businesses. 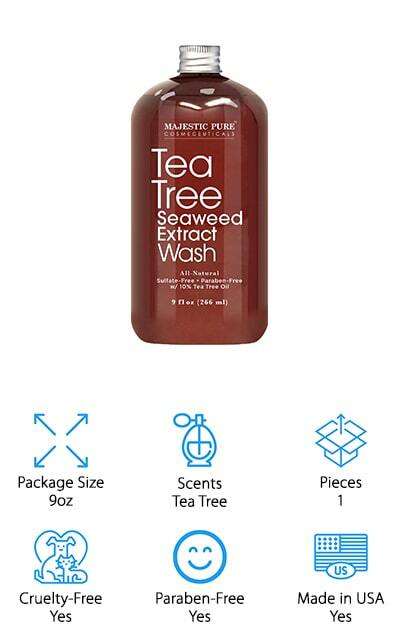 It’s also a seaweed extract wash, meaning that it’s going to work to lift and extract all the impurities from your skin and out of your pores while soothing and leaving behind no irritation. It’s gentle enough for use every single day and all skin types can use it, from oily to combination or sensitive. This natural cleanser is strong, so if you have particularly sensitive skin Majestic Pure recommends testing a small area of your skin before applying it all over for the first time. It’s completely cruelty-free as well so you can ease your mind any animal testing. Overall, this is a great natural body wash to try! 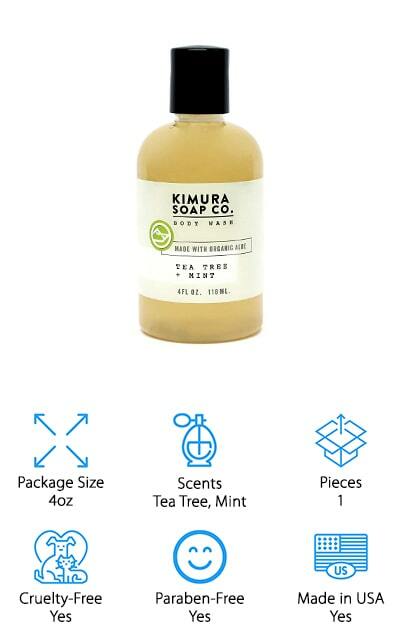 Kimura makes the best natural body wash for sensitive skin with their organic tea tree and mint wash. All of the compounds are sourced right from the earth itself, so you can rest assured that there are no chemicals. Just botanicals, essential oils, and plant extracts with no added fragrances or synthetic ingredients. Tea tree oil is the main ingredient in this body wash, which acts as an anti-bacterial as well as a detoxifying agent for your skin. Keep your skin looking and feeling great! All parts of the soap and packaging are made right in the USA, so you can be happy that you’re supporting a company based here at home if that’s important to you. The scent is light and just as natural as the product itself. Plus, it comes with a 100% satisfaction guarantee so that you can get your money back if you don’t like it. We’re sure that you will though! 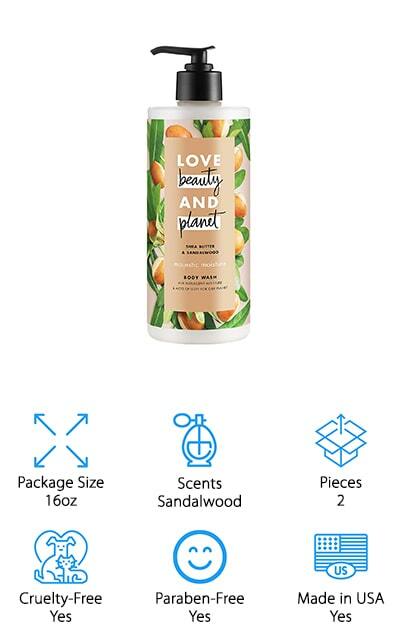 Love Beauty and Planet make this beautifully sandalwood-scented natural body wash. You get two 16-ounce bottles in this purchase. It’s infused with organic coconut oil to help moisturize your skin. It works with the shea butter as well, to help keep your skin feeling great and staying hydrated. 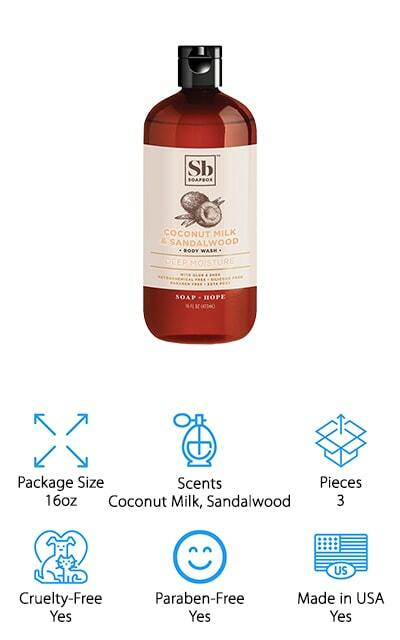 The sandalwood has a nice, earthy smell that you’re going to enjoy. That masculine scent makes it one of the best natural body wash for men, though you can, of course, use it if you are a woman. You can start protecting your skin against dryness in the shower, and this shea butter and coconut oil-infused wash is a great place to start. It’s made with entirely plant-based cleansers, with no sulfates, parabens, or other harsh chemicals. It’s entirely vegan and never tested on animals. We’re sure that you’re going to love this great-smelling body wash from Love Beauty and Planet, and your skin will feel great! 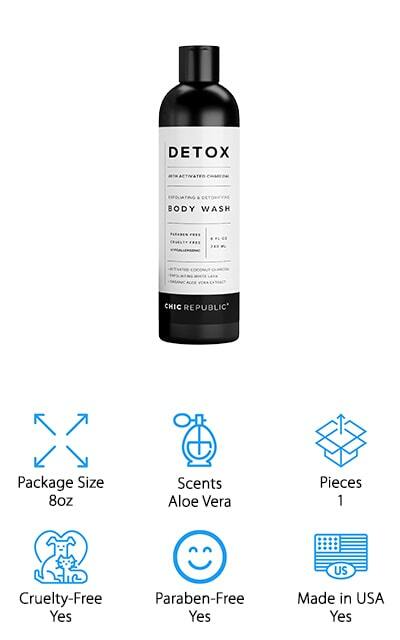 The last body wash on our list is this Detox was from Chic Republic. It uses the power of both coconut and charcoal to help detoxify your skin from impurities while you’re moisturizing your skin. It’s a doubly beneficial system that we can’t get enough of! It also uses the power of aloe vera to provide intensive hydration and reduced inflammation after exfoliation, and that exfoliation comes in the form of white lava. The volcanic minerals remove dead skin from your body and help to coax healthy cells to stay that way. This body wash has a lot going on, but all of it is really beneficial to making sure your skins looks and feels great. If your skin is naturally dry or sensitive, give this a try; you might just find it softening up! Everything about this wash, including the hypoallergenic and cruelty-free properties, make it an amazing soap to try out. It’s made in the USA too!